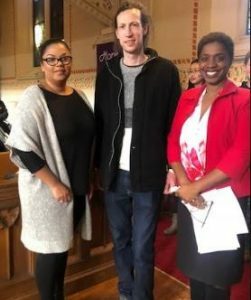 Victoria Less, Andy Burke and Charmaine Magumbe at Black History Month 2019 launch. The Community Race Relations Committee of Peterborough (CRRC) is a non-profit community-based organization committed to encouraging and promoting anti-racism and equitable race and community relations throughout Peterborough/Nogojiwanong. CRRC supports the basic principle that all individuals in Canada are equal in dignity and rights, and its strategies are aimed at identifying and eliminating all forms of institutional and systemic discrimination while recognizing the ways in which all forms of oppression from sexism and queerphobia to social class and colonialism intersect with racism. CRRC is available to assist community members, students and/or groups on matters relating to racism and ethnic discrimination within a variety of contexts through advocacy supports, consultation services, and public education initiatives/events for the purposes of promoting greater understanding of race-related and community issues. Any and all who may experience racism and other social ills within any of Peterborough’s spaces and/or wish to help challenge it are encouraged to connect with CRRC as we venture to build a most inclusive region across our many diversities. Join us on Facebook! Like our page or join our group. Want to join the CRRC? Please go here. The CRRC formed in response to racist attacks on international students at Trent and Fleming College with the objective of raising awareness, educating and documenting issues of racism in the Peterborough community. Nigerian students studying at Trent University and Sir Sandford Fleming College report ongoing harassment, racial slurs, and discrimination in Peterborough. During one of these incidents, an African student was physically attacked while bystanders stood silent. This attracted the attention of both local and national media, and led to the creation of the “Citizens’ Committee on International Racial Relations” by Mayor Robert Barker. The Committee’s mandate was to investigate the nature of the problem of racial discrimination in Peterborough. The committee provided a report and recommendations to the Mayor and City Council. In May, following City Council’s endorsement of the report and its subsequent approval of a Policy Statement on Community and Race Relations, Mayor Barker appointed a permanent committee, and thus, the Community and Race Relations Committee of Peterborough (CRRC) was formed. It served as a forum for recording incidents of racial abuse or discrimination, and for receiving the information concerning interracial relations in the Peterborough area. CRRC separates from City Council and becomes an independent voluntary organization. CRRC moves from City Hall to the basement of 180 Barnardo Avenue. CRRC focuses heavily on education efforts in the public sector to increase awareness of issues of both individual and systemic racial inequality and discrimination. An anti-racist approach is adopted. CRRC receives core funding from the Ontario Ministry of Citizenship. During this time, the CRRC publishes a newsletter, provides workshops for both public and private sector organizations, hosts youth initiative for March 21 International Day for the Elimination of Racial Discrimination, and acts as a partner and leader for the Multi-faith Conference. Funding resources were dramatically reduced and the City of Peterborough was CRRC’s sole funder. While services have been reduced, we continued to provide resources and lunchtime discussions. CRRC receives funding from the Ontario Trillium Foundation, enabling resources to be diverted to the hiring of a full-time Coordinator and increased community programming. CRRC has continued to provide programming in the form of community discussions, workshops, and anti-racist training. The organization continues collaborating with other community organizations to further anti-discriminatory practices within the corporate, governmental, non-governmental and educational sectors. Developed an Anti-racism Workshop Manual for high school students and deliver hundreds of anti-racist training opportunities. The Community Race Relations Committee of Peterborough is the community members who ensure its enduring relevance and engagement in the life of the City. We are grateful for the many gifts and hours given freely by our Board members.